We have written on this blog before about reclaiming silver from the chemical solutions that are used to develop x-rays and photographs. Today, we would like to address a slightly different issue . . .
Can silver be profitably recycled from printing ink? The answer to that question is yes, silver can be obtained from many printing inks. When you introduce the right chemical into them, the silver precipitates and falls to the bottom. But here is some additional information you need to know. What Kind of Inks Contain Silver? Black and colored inks that have been used for years to print on paper. Not all such contain enough silver to recycle profitably. Some do not contain silver at all. But many do. 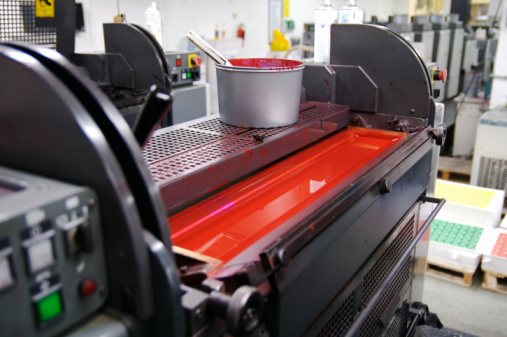 If you come into possession of a large quantity of ink after you buy a printing business (or a newspaper or a chemical company), there could be a windfall profit in silver waiting for you to claim. We will be pleased to test a sample of what you have and tell you how to turn your unneeded inks into cash. Call us at 800-426-2344 and we will tell you how. Conductive inks that are used to manufacture printed circuit boards and other electronic components. You might not know too much about this relatively new technology, but it is quickly becoming one of the preferred methods of producing printed circuit boards. In this technique, ink that contains silver and other metals that conduct electricity are printed onto plastic boards or other surfaces. The pattern that is left then serves as a printed circuit board. Conductive inks are already being widely used to manufacture touchscreens, automotive components, medical equipment, and the circuitry that is used in the advanced batteries for electronic and hybrid cars. Incidentally, the chemical giant DuPont is a leader in developing this technology. Here’s an interesting video explaining how organic and printed electronics are made, and the incredible number of applications and cost benefits that explain why this technique is becoming more popular. If you come into possession of a quantity of these inks, contact us at 800-426-2344 and we will tell you how to turn your ink into cash.